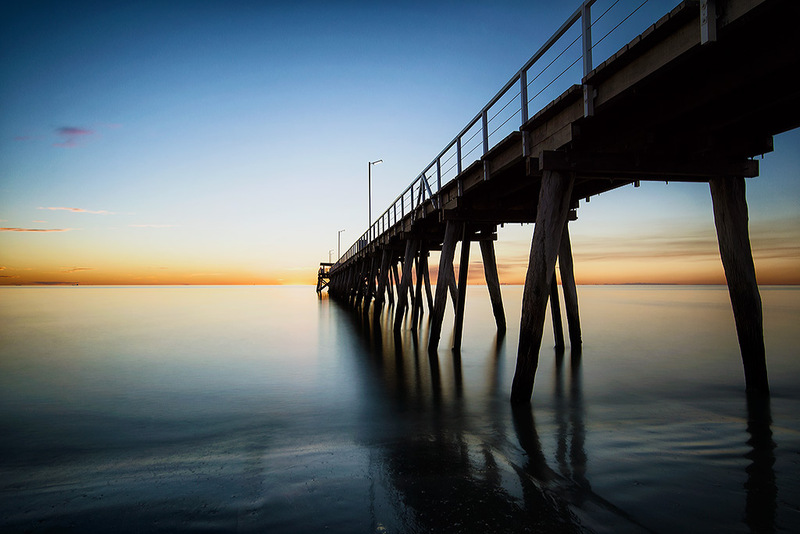 Largs Jetty, located at Largs Bay in Adelaide is one of many long jetties or piers scattered along Adelaide’s beaches. If you’re after a classic jetty shot this is a great spot for it ! Like most of Adelaide’s beaches, the long gentle slope of the sand under and around the jetty lends itself well to any tide. With the right sky and wind direction this would be a great location for long exposures. There are lights along the jetty so you will need to take that into account if you want to try night photography at this location. Normal landscape/seascape gear – wide angle lens, filters, tripod, cable release etc. Torch if you’re doing night photography. Given the jetty faces west sunset would be the best time of the day. However if you want to avoid crowds during the warmer months then sunrise might also be an option with the right cloud conditions. This location can be shot at any tide as there is plenty of room from the start of the beach to the water’s edge. Wind conditions will impact here so take note of the wind direction. A strong westerly will have you wiping your lens clean on a regular basis. A strong easterly will drive any clouds over your head and would be good for long exposures using a big stopper filter. Largs Jetty is located at the corner of Jetty Road and Esplanade in Largs Bay, Adelaide. There is parking next to the jetty but it is only for an hour, so you may want to consider off street parking if you’re worried about overstaying your parking time. Thanks for the guide Glenn.. well done! I would love to purchase your Largs Jetty photo in a large format canvas print. What nd filter did you use?